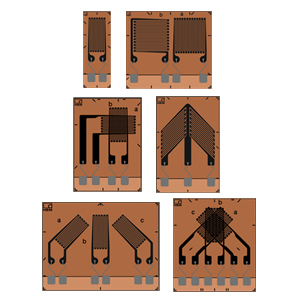 M Series strain gages have been specially developed for high resistance to alternating loads at increased strain levels and high temperatures up to 300°C (572°F). They are foil strain gages with measuring grids made of a special nickel-chromium alloy. OMEGA/HBM offer this special strain gage with various geometries, measuring grid lengths and temperature response matching. New materials offering high strength such as fiber composites pose a major challenge for strain gages used for measurements specifically when pushing components to their mechanical limit of performance. Situations may arise where a strain gage subjected to alternating loads at increased load levels is weakened and fails earlier than the component under test. The M Series has been specially developed for high resistance to alternating loads and allows for testing of materials featuring high strength. The right measuring grid length: The measuring grid length depends on the aim of measurement, since the result of a measurement with strain gages will be determined as the average of strains. In general, measuring grid lengths of 3 to 6 mm (0.06 to 0.24") generates a better result. Long measuring grids are recommended where there is an inhomogeneous material such as concrete or wood. A long strain gage will bridge the inhomogeneity of the work piece and return the strain underneath the measuring grid as the measurement result. Short measuring grids are suitable for detecting a local strain state. Therefore, they are suitable for determining strain gradients, the maximum point of notch stresses and similar stresses. Nota: † Maximum permitted effective excitation voltage specified for steel material. Instructions for Use of Accessories shown under Product Manuals below. All listed adhesives are specifically designed/approved to be used for the new M Series of strain gages. Safety Data Sheets for Accessories can be found (without "1-" Part Number prefix) at omega.com, Support, MSDS.